This Mexican Adobo sauce recipe is made using “Ancho” and “Guajillo” peppers, garlic and black peppercorns. A sauce made with few ingredients, but with an exceptional cooking potential. 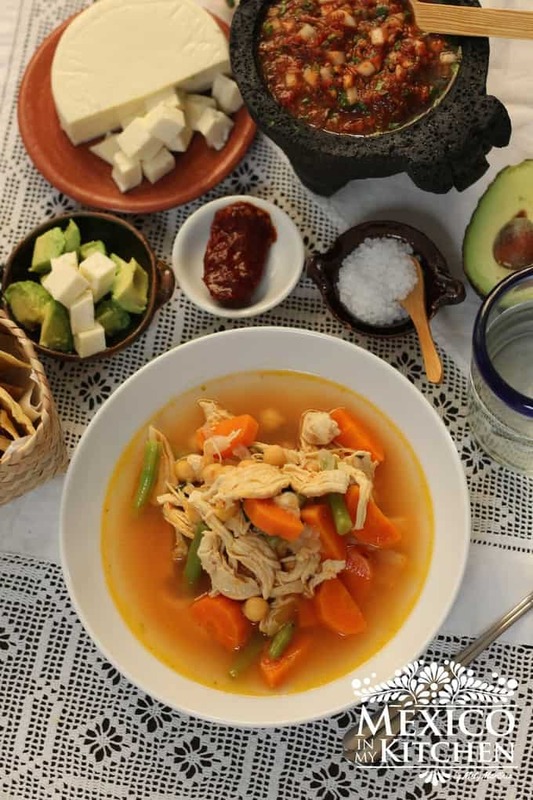 It is excellent to have it handy in your fridge or freezer since it is remarkably useful for many dishes like red enchiladas, pozole, tamales, pork stew, menudo, chilorio, chilaquiles, and many other traditional Mexican dishes. I consider it as a basic Adobo sauce for stews, too. Adobo sauce is a mixture of dry peppers blended with spices and vinegar to season meats, mainly pork, and either prepare a stew with it or just rub the paste over the meat to marinate and grill. Although some adobo sauces could also use other types of dried peppers, like Pasilla or Mulato. This last one is very similar to the Ancho pepper, but with a darker color. Making this Adobo sauce is not too complicated, but it requires a little time cleaning the peppers. So, when you prepare the sauce, try to double the amount to always have some extra in your freezer for those days when you are in a hurry and need to make dinner in less time. By the time that you need to use it, just add the herbs or spices needed. The most common herbs and spices used are bay leaves, thyme, oregano, and cumin. Place the cleaned peppers in the warm water, and soak for 10-15 minutes. Once the peppers are soft place into a blender with the garlic and black peppercorns. Add 1 ½ cup of the soaking water and process. If you have a professional blender your sauce will very smooth and you won’t need to pass the sauce through a sieve. Store in a glass jar in the fridge for up to three days or in the freezer for 3-4 months. Stir well after defrosting. To use season according to the recipe of the dish you are preparing. Making this Adobo sauce is not too complicated, but it requires a little time cleaning the peppers. So, when you prepare the sauce, try to double the amount to always have some extra in your freezer for those days when you are in a hurry and need to make dinner in less time. Best Adobo Sauce Recipe. With the help of your kitchen scissors or a small sharp knife, make a slit cut along the pepper to remove the seeds and veins. Once the peppers are the soft place in a blender with the garlic and black peppercorns. Add 1 ½ cup of the soaking water and process. If you have a professional blender your sauce will very smooth and you won’t need to pass the sauce through a sieve. When buying dried peppers make sure you are buying the right peppers. I have found some brands labeling to be incorrect, sometimes naming Mulato peppers to pasilla peppers. I usually post the pictures of the peppers I am using in a recipe to avoid confusions. If the pepper is too dry that it breaks while handling, place it a couple of minutes in a warm skillet, not hot! Just warm and turn frequently, this will help the skin to soften. Or place in the microwave for 10 seconds. PS. Please share other dishes where you use this sauce. Thanks! Previous Post: « Why this is one of the best street foods in Mexico? I'll be making some soon. I'll freeze it though. Thanks. I have a ton of various dried chiles that I need to use and this is a perfect idea. Thanks! Yes, with that type of blender it is a breeze making this salsa. Enjoy and thank you for stopping by! Thank you for the pepper sauce recipe! The fact that it does not have sodium makes it a heart healthy recipe that I can use and I greatly appreciate that. It's nice to see you find it helpful. The sauce is very versatile, I have many uses for it. Enjoy! I love this sauce! I just finished making some. What other dried peppers can I add to this sauce? If you want to make it spicy add arbol pepper or chipotle peppers. If you want it to have a more robust flavor add pasilla peppers. Adding the pasilla peppers gives you the option to used it for more elaborated dishes like roasted meats either chicken, turkey or pork, or used in stews, moles and tamales. Voy a tratar de ponerla mañana. Gracias por esperar.